economics of the nuclear industry and its campaign for subsidies. Dr. Caldicott first asks Dr. Diesendorf to talk about nuclear power and CO2 emissions. He explains in detail how fossil fuel is used at all steps of the nuclear fuel cycle, except for operation of the plant, debunking the propaganda that nuclear power is a solution to global warming. They talk about studies of energy use by the uranium industry, deaths induced by exposure to uranium in mine workers, and the importance of remediation of uranium tailings, in other words, putting them back in the ground. Dr. Diesendorf and Dr. Caldicott next look at the enormous and increasing costs of maintaining old nuclear reactors and building new ones. See the Union of Concerned Scientists’ article Nuclear Economics 101: The Industry Gets a Failing Grade. Read the article Designs for New UK Nuclear Reactors are Unsafe, Claims Watchdog: Major setback for energy plans as report finds flaws in US and French models. Diesendorf stresses how wrong it is to supply nuclear-power technology to countries around the world, laying the basis for more and more nuclear-weapons states who threaten each other. He talks about how even a limited nuclear war, such as one between India and Pakistan, would have devastating effects on the world’s agriculture and might even induce a nuclear winter. Listen to Dr. Caldicott’s 2008 interview with nuclear-winter expert Professor Alan Robock. In discussing the costs of nuclear power, Diesendorf notes that it will cost over $100 billion just to decommission England’s nuclear reactors. He points to detailed studies on the economics of building new nuclear power plants in the U.S., including a 2009 study by Craig Severance. Read two articles on the Severence study, The Staggering Cost of New Nuclear Power and Warning to Taxpayers, Investors: Nukes May Become Troubled Assets. Check out the Severance study, Business Risks and Costs of New Nuclear Power. Read Accident Casts Fresh Doubt on Nuclear Safety about the November 21 incident at the Three Mile Island plant in the U.S. which forced the evacuation of 150 workers and exposed 20 people to radiation, and about plans for a new reactor in Maryland. Dr. Caldicott’s 2008 interview with Professor Hansen. Dr. Diesendorf and Dr. Caldicott agree that eliminating coal emissions is absolutely critical to stabilizing the world climate. Yet, Dr. Caldicott says, the Australian prime minister and federal government are subsidizing coal production. She is not optimistic about the forthcoming Copenhagen conference, where she expects most politicians to make weak proposals, essentially doing the bidding of polluting industries. Dr. Diesendorf refers to Dr. Arjun Makhijani’s book, Carbon-Free and Nuclear-Free: A Roadmap for U.S. Energy Policy, which can be downloaded for free. Dr. Makhijani, an engineer, found that renewable and safe energy can meet all the world’s energy needs without the need for carbon- or nuclear-based power. Listen to Dr. Caldicott’s 2008 interviews with Dr. Makhijani here and here. See the new report by Mark Jacobson and Mark Delucchi, Evaluating the Feasibility of a Large-Scale Wind, Water, and Sun Energy Infrastructure. Dr. Diesendorf elaborates on the immense growth in wind and solar power, and the new developments in geothermal energy. While the nuclear energy falsely promotes itself as safe, green and a solution to global warming, the coal industry is also engaging in major deception. Read Greenwash: Why ‘Clean Coal’ is the Ultimate Climate Change Oxymoron. President Obama has received over $250,000 from the nuclear energy industry throughout his career, and he and his Secretary of Energy Dr. Steven Chu endorse nuclear power. President Obama also supports coal. Read RFK Jr. Blasts Obama as ‘Indentured Servant’ to Coal Industry. Dr. Caldicott closes by encouraging readers to buy Dr. Diesendorf’s book Climate Action to inform themselves about solutions to the energy challenges the world faces. To check out articles by Dr. Mark Diesendorf, read Can nuclear energy reduce CO2 emissions and Muzzling the greenhouse debate and How to reduce CO2 emissions by 50% and Sustainable energy has a powerful future and and The base-load fallacy. 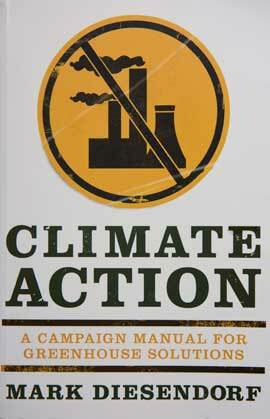 Also see his 2007 book Greenhouse Solutions with Sustainable Energy. For more on the hazards of nuclear power and why it is not a solution to global warming, read Dr. Caldicott’s books Nuclear Power is Not the Answer and Nuclear Madness. Also check out this website’s Reports page which has several reports under “Nuclear Power” on the dangers of nuclear energy and the nuclear industry’s propaganda around climate change (scroll down the page almost halfway). This entry was posted on Monday, November 23rd, 2009 at 12:00 am	and is filed under Uncategorized. You can follow any responses to this entry through the RSS 2.0 feed. Both comments and pings are currently closed.